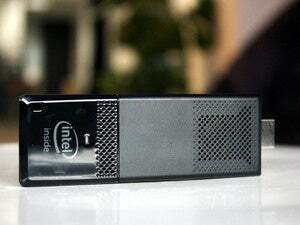 Is Intel's Compute Stick a solution looking for a problem, or is this PC the size of a USB stick a solution to a problem you didn't you know you had? You know, like dude, I can't stand my so-called smart TV's pathetic browser and horrible remote control interface. Or maybe you want something you can slip into your front pocket, just in case you need access to a computer. The latter is the strongest appeal of the Compute Stick. Paired with a good keyboard and mouse (I recommend Logitech's K400 or K830 for a living room experience) you can turn your average dumb TV into the class valedictorian. It's literally a complete mini PC, powered by micro USB. It plugs into any full-size HDMI port. As a way to make any TV or HDMI monitor into a smart device, the Compute Stick is without equal in portability, price and size. As a truly portable computing device you'll take everywhere with you, well, I'm not quite sure it works. The Compute Stick itself comes in two flavors. The most popular one is going to be the pricier version running 32-bit Windows 8.1 with Bing. That one packs a quad-core Atom Z3735F, 2GB of DDR3/1333 memory and 32GB of eMMC storage, plus integrated 802.11n and Bluetooth 4.0. Intel didn't disclose formal list prices, but it's expected to sell for $150. A Linux version running Ubuntu cuts main memory down to 1GB and sees storage fall all the way back to 8GB. Giving up the hardware though, will save you $40, as it's expected to sell for $110. Since it doesn't seem like the $40 difference can be attributed just to RAM and eMMC, I asked Intel if the cost of an OS was a factor. Windows 8.1 is technically "free" on tablets with screens under 8 inches, but there's no screen on the Compute Stick. Neither Intel nor Microsoft would comment on OS pricing for this new class of device, so it makes me wonder whether screenless sticks will qualify for WinBing. In ports, you get a single USB 2.0, a MicroSD slot rated to work with 128GB cards, and a MicroUSB port used only to provide power. Intel gives you a typical 2-amp wall wart with a USB port on it. Overall power consumption is superb: The Compute Stick normally consumed half an amp in use and only rarely spikes up to 1.5 amps. This means you can get your your computing on in 2.5 watts of power, which is probably as much as your phone eats while being charged. Don't expect to use any old wall wart, though: I tried an Apple iPhone charger as a power source and was greeted with reboots. A generic two-watt unit did fine, though. The biggest problem on the Compute Stick will be storage. With 32GB of eMMC, you end up with about 15.5GB available after installing Windows updates. The rest is eaten up by image files. Depending on your needs that's not much to play with. The good news is that at least it seems fairly fast for a low-cost eMMC. I measured it at 167MB/s reads and 73MB/s writes in sequential file access using Crystal Disk Mark. If you really do need to store a ton of data on the Compute Stick, there is that microSD slot, right? 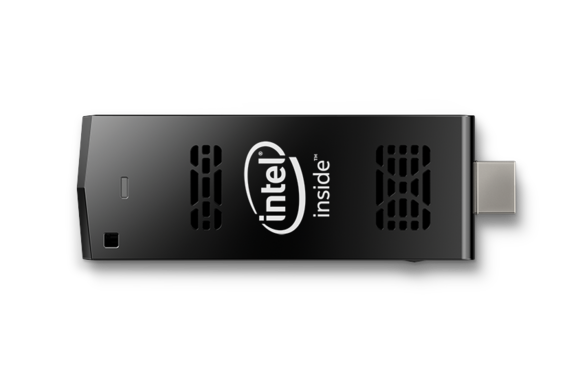 Intel's new Compute Stick is a pocket computer you can plug into any HDMI stick. Here it is next to a typical USB drive and the Rasberry Pi 2. Intel smartly includes a short 8-inch HDMI extension cable because the unit is so chunky, it might not fit behind a lot of TVs or monitors. You just plug in the Compute Stick to an open HDMI port, plug in the power and plug in your combo mouse and keyboard. Yes, you will need a combo mouse and keyboard initially. The unit features Bluetooth 4.0 but you can't get to that setup screen until you're in Windows. Because it only has one USB 2.0 port, you'll have to choose between a mouse or keyboard until you can pair more items—and you'll need to use a keyboard to get things started. I'm not going to get hung up on the performance of Intel's Compute Stick, and neither should you. That doesn't mean I ignored it. I ran an entire suite of benchmarks to measure the Compute Stick's performance in everything from CPU to graphics to storage. The verdict is that for the most part, performance is similar, although slightly slower, than what you'd get on the typical Windows 8.1 tablet with a Bay Trail Atom inside. Despite this, I know you want to know what kind of performance you can squeeze out of a stick computer. Does it give up a lot to get into a case the size of a fat USB stick? Not really. I compared it to a Lenovo Yoga tablet 2 10-inch packing the Atom Z3745 inside, and performance was close. The quad-core Atom in the Compute Stick also outpaced the HP Streambook with its dual-core Atom Celeron N2840. Where the Compute Stick loses most ground to its contemporaries is in graphics performance. Running 3DMark's Ice Storm Unlimited, I saw the Compute Stick about 25 percent slower than a typical Atom Z3745 tablet. I attributed this to the memory bandwidth on the unit. Rather than dual-channel mode, the Atom Z3735F runs in single-channel, which means memory bandwidth gets the short stick. 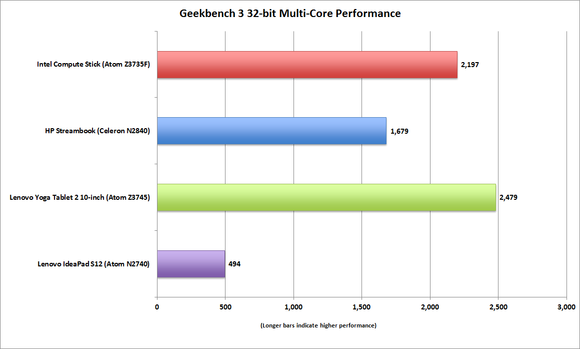 Intel helps ameliorate this using DDR3/1333, though. The Yoga Tablet 10 actually operates at 1066MHz and is fairly anemic in synthetic memory tests. The warning to you is, don't expect to run any games outside of rudimentary Flash games on the Compute Stick without having a frowny face. For comparison, we ran a couple of basic browser benchmarks on the Raspberry Pi 2 unit using the Epiphany browser. The Chrome browser was not available on Ubuntu. The Raspberry Pi 2 scored 318 in the Google Octane V2 test and 14,582.8 in SunSpider 1.02. The Compute Stick hit 6,015 in Octane V2 and 831.2 in SunSpider. So yeah, we're looking at a world of difference in browsing performance, at least, between the Rasberry Pi and the Compute Stick. Computing on the Raspberry Pi can be done, just rather painfully. Intel's Compute Stick offers multi-core performance fairly close to a typical 8 or 10-inch Atom-based tablet and motors past the dual-core Celeron N2840 in the HP Streambook too. For comparison, I've also thrown in an old Atom Netbook score so you can shudder in disgust. What can you really do with it? What you just read is more than enough about the Compute Stick's raw performance. Of greater concern should be just what you can really accomplish with the Compute Stick. Can you do anything of consequence with it? Yes. You can run a real browser, install plugins, and stream 1080p video from any source. You can run Office just fine, and even Photoshop in a pinch. Generally you won't notice its limitations, but with 2GB of RAM, you won't want to multi-task too heavily or at all. You won't want to have 18 windows open in Chrome, for example. Running Outlook with Chrome and a chat client is about at the boundary of what you can do on it. It's essentially fine for basic computing tasks, with some patience. So who the hell needs this thing? Ultimately the Compute Stick is a new category of computing device. 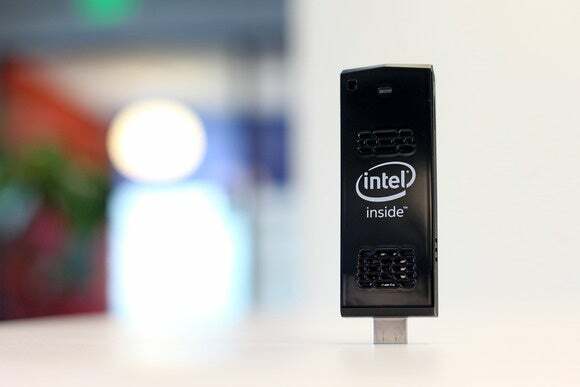 Just as Intel helped push mini PC's such as its NUCs into popularity, the company is hoping to spark some kind of unheard of usage model with stick computing. What that is, I'm not sure. As an instant and fairly affordable way to make your smart TV actually smart, it's a win. Combined with a good living room keyboard and mouse, you can browse the web from your couch with a full fidelity browser capable of running all the plug-ins you need to say, stream NILF Island from your favorite off-shore, black-market web site. That doesn't work in 95 percent of streaming devices. As a shirt-pocket PC, yes, it can work but it doesn't quite make sense. It's not like you'll keep this in your pocket, go to your friend's house and just "borrow" his or her TV. You still need a mouse and keyboard to use the Compute Stick and with a single USB port, you're forced to pick between the two. Maybe he or she has a Bluetooth keyboard. Or maybe you could also pack a folding Bluetooth keyboard and mouse but at that point, why not just pack an 8-inch Windows tablet instead for your emergency computing? Still, this is uncharted territory Intel is operating in. As a complement to a TV or to make an old monitor "smart," I get it and at $150 with the OS, it's a deal. What I'm not clear on is the portability usage. Maybe that'll come to me but for now, the Compute Stick finds a good home on my TV. Make your so-called Smart TV actually smart. Ships with Windows 8.1 Bing. Will need to bring keyboard and mouse to use.